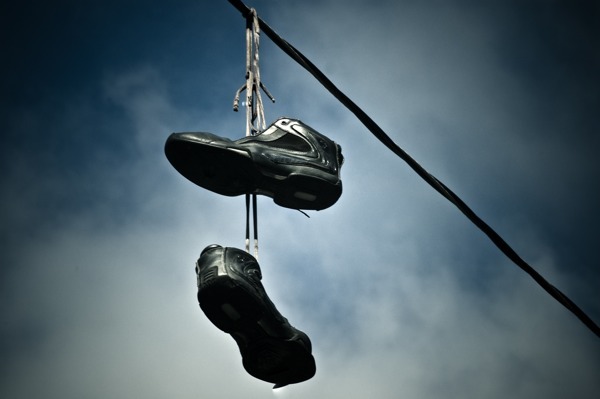 The term "shoefiti", a composite of shoe and graffiti referring to the act of flinging shoes over a telephone wire or power wire to hang by their laces, is considered to be a global example of ostensive behavior. On the way we passed pink-eared elephants, brick-kilns and churches that looked like Chinese pagodas. Most of the slogans were welcoming. But from time to time a string of old shoes was suspended across the road: the worst of all Hindu insults. One graffito read, ‘Indira Gandhi is a notorious fascist witch'. 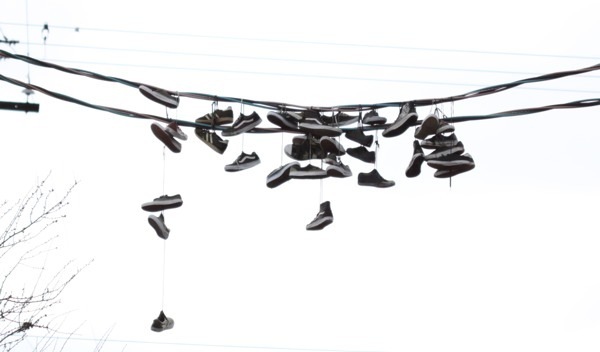 These sneakers tossed over wires in the Bronx denote a) a crack den; b) loss of virginity; c) run-of-the-mill bullying; or d) the urban myth of your choice. When driving along the bumpy streets of Munsieville, a township near Johannesburg, one cannot help but notice the shoes dangling at regular intervals from wires strung high across the road. Tennis shoes, boots, children's shoes of various sizes, single ones or pairs - a surreal sight. What are those perfectly good shoes doing up there? Who in this poor neighborhood can do without shoes, and even to go the trouble of hanging them way up there? Our driver's explanation silences all cheerful attempts at guessing the answer: the shoes mark the borders between territories that are controlled by different drug gangs. They are a warning to those who do not follow the gangs' law: you won't be needing your shoes any longer. They have been a common sight above the streets of Bristol for many years, but to most their meaning has been a mystery. Dangling from telephone wires, shoes can be found suspended by their laces above terraced roads everywhere from St George to St Andrew's. To some, they are simply an eyesore. But for police there is a more sinister explanation for their presence – they believe they reveal the locations where illegal drugs can be bought. Officers have now hired a cherry picker to remove shoes hanging from wires in St Paul's and St Werburgh's. Interesting to note that officers removed the hanging shoes, not the illegal locations. Anyway, besides an Hindu insult and a crack house street sign there's much more. Shoe-flinging/tossing can also be found everywhere. 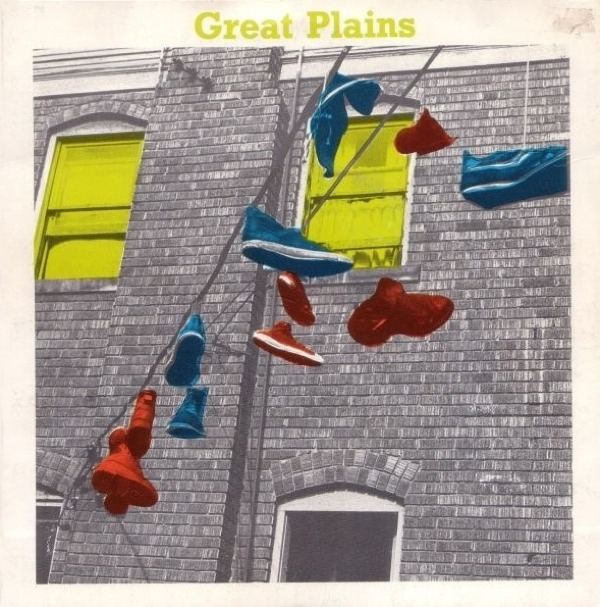 Even album jackets. … but I walked faster, our shaded unit traveling as one, until it split when I ambled in front of the bar, just below the dangling tennis shoes still suspended from the sky, still perched over the wire, still providing notice to drug addicts of where to get their fix; only now, they were drenched with darkened exhaust from car engines, cigarette ash floating out from open windows on third-floor apartments, and acid rain.